If you have a file you’d like printed, fill out the 3D Print Request Form below and we’ll add your request to our 3D print queue. You'll get an email you when your print is ready to be picked up. Don’t worry about cost. It’s all free! Cookie Casteropens a new window is a site where you can easily design a cookie cutter in minutes! Draw your own shape or trace an existing image to create your cookie cutter file. 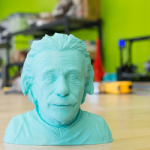 Bust of Einstein, printed with a LulzBot Mini. Tinkercadopens a new window is a great tool for beginners and experts alike. Create a free account to build a 3D design in this browser-based 3D solid modeling tool. Chrome and Firefox browsers work best. Onshapeopens a new window is a powerful tool appropriate for prototyping engineering designs. Create a free account to access this full-featured browser-based CAD software system. Schedule an appointment or visit a technology specialist in your library if you’d like help getting started. Attach your .STL file, and we’ll add your request to our 3D print queue! Our Technology Specialists will email you when it’s ready to be picked up. * indicates a required field. At which library would you like to collect your print? If your file is over 9MB, fill out this form without the file and a Technology Specialist will reach out with instructions. Keep in mind, this form is only for items smaller than 5.7 x 5.7 x 6in. Allowed file extensions - stl. Can we resize your 3D design file if necessary? Can you tell me more about this webform submission? The contents of this webform are sent to library staff via email. We recommend that you do not submit confidential information (like your library card number, passwords or credit card information). If you need to share confidential information with library staff, we suggest that you use other channels of communication, such as the telephone. Visit our Privacy Statement, opens in a new window to learn more about how your personal information is handled and protected. This information will be submitted via email. Learn More. 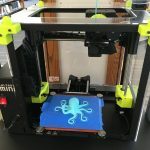 Why does the library have 3D printers? Can I get something 3D printed? What kind of 3D printers does the library have? How much does it cost to have something 3D printed? Do you have 3D scanning technology available? If I don’t design something myself, can I still get a 3D printed item?